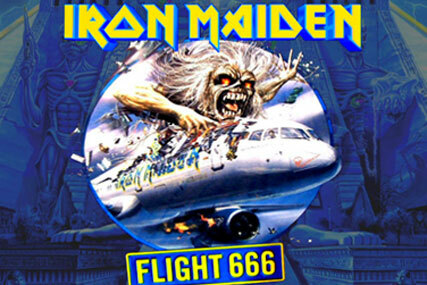 Gatwick-based Astraeus Airlines has appointed Bruce Dickinson, Iron Maiden's front man, as its new marketing director. Dickinson, a qualified pilot, will start his new position at the charter airline with immediate effect, combining the role with his touring commitments with the heavy metal band. Dickinson has a long-standing relationship with the airline and is a part-time captain for the company's 757 fleet. The "addition to [the] senior management team of Bruce Dickinson as marketing director" was announced on the company blog by Mario Fulgoni, chief executive of the airline. He said: "Many of you will know Bruce as the lead singer of the famous heavy metal band Iron Maiden. Some of you may not know that he is also an experienced professional pilot and flies with Astraeus as a Captain on our 757 fleet. "I have worked with Bruce for a number of years now, in various capacities, and he is a very accomplished business promoter as well as pilot, so I am delighted he has agreed to join my team." Also on the site, under Breaking News, the company said: "With the rapid growth in the business we have increased our commercial team, Bruce Dickinson as our marketing director, Claire Ronson has now moved to sales and marketing to support our sales team. "Finally our product and planning is now covered by Seb Pelissier. Seb joins us from a catering and customer service background working with us previously as a supplier." Dickinson's releases with Iron Maiden include 'The Flight of Icarus'. One of his new tasks with the airline will be to "expand the series of videos" the airline produces "that explain and promote the services" to Astraeus' clients. Astraeus Airlines was the principle supplier of cargo and passenger carriage for Iron Maiden's 2008 'Somewhere Back in Time' tour. The tour covered 20 cities in 13 countries over a period of three months. The airline converted a Boeing 757-200 for the tour. Dickinson, at the time, said: "As a professional pilot and a professional singer with Iron Maiden, there was no doubt that Astraeus Airlines were the people for the job. "The reliability was superb, and the outcome exceeded the band's wildest expectations. A unique airline, for a unique experience. Astraeus Airlines made it happen." Astraeus Airlines operates from Gatwick and Manchester and has a fleet of 11 planes.